Looking to bag a bargain on Canon kit with a cheap DSLR camera or a great mirrorless deal? You’ve come to the right place. We're constantly searching for the biggest discounts and cheapest Canon cameras on sale that we can find – and we’ve rounded up the best prices from the most reputable retailers right here. What’s the price of a Canon camera? Roughly speaking, Canon cameras range in price from around $180/£150 for a compact like the Canon PowerShot SX620 HS, or $350/£250 for an entry-level DSLR like the Canon EOS Rebel T6 / EOS 1300D, through to $3,000/£3,000 (and higher) for a full-frame DSLR like the Canon EOS 5D Mark IV. As a general rule, the more advanced you are and the more features you require, the more you should expect to pay for your camera. However, fantastic Canon deals do exist – and you’ll find the best ones right here. From compacts to mirrorless cameras and DSLRs, these are the best deals on our favourite cheap Canon cameras. The EOS 200D / Rebel SL2 is a very capable, super-compact, entry-level DSLR that’s easy to use and performs superbly. In fact, it’s a much better camera than its predecessor, the EOS 100D, and only very slightly larger. The Dual Pixel CMOS AF system in live view is excellent, while the refined touchscreen control and vari-angle display all add to its ease of use. 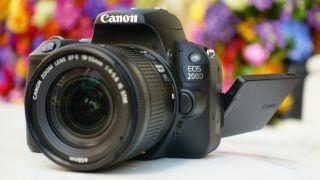 The lack of 4K video is disappointing, but if you’re looking for a reliably performing camera that’s well supported by a wide range of lenses and accessories, the EOS 200D is a top buy. The EOS M50 comes with a built-in viewfinder and a lot of Canon’s latest tech, all packed into a compact body, making it great value for money. It’s a very likeable camera that’s easy to use if you're just getting started, although it also offers a full degree of manual control for those looking to get creative. Image quality is great, although the retracting EF-M 15-45mm f/3.5-6.3 IS STM is a little awkward to use, and the 4K video mode has some unexpected limitations. That said, on the features-to-price front, the EOS M50 has sneaked ahead of other mirrorless cameras. Where else will you get a 24MP APS-C mirrorless camera with a viewfinder at this price? The Canon PowerShot G7 X Mark II is a fast, capable, premium compact that captures sharp, detailed images across a wide range of ISOs. It’s particularly good for enthusiasts, thanks to its manual control and Raw format shooting options, and the camera's pocket-friendly size makes it a handy travel camera too. A built-in viewfinder and fully articulating screen would have been welcome additions, but the tilting touchscreen is handy when it comes to awkward shots. This is a great compact camera that packs a strong performance for the price. This is Canon's cheapest entry-level DSLR, and although it's basic, it’s a perfectly adequate camera for a student or cash-strapped beginner who just wants to get started. It has one of Canon's older 18MP sensors, but the quality is pretty good nonetheless, and there's enough manual control for anyone who’s advanced beyond the basics and now wants to develop their photographic skills. The Canon Rebel T6i / EOS 750D is a fantastic first-time DSLR, with plenty of growing room for new users. It shares the same 24MP Hybrid CMOS AF III sensor as the related EOS 760D, and essentially the same internal hardware too. The only real differences are external, where the EOS 760D adds a top-plate LCD screen and a second control dial. Image quality is great, and one of the best things about the EOS Rebel T6i / EOS 750D is the fact that you can use it with 30 years' worth of lenses and a wide range of accessories, making it a fantastic foundation for a more comprehensive photographic setup. The EOS M6 is essentially the same as the EOS M5, but without the built-in viewfinder (though you can get one as an optional accessory). This might be considered to be a drawback, but not having a viewfinder does make the body slightly smaller and neater. If we were to choose a Canon mirrorless camera for enthusiasts, it would come down to this or the EOS M5. If you already have a Canon DSLR, you can use your existing lenses on EOS M cameras via a lens adaptor too, so it's a good option as an upgrade for an older model or as a backup camera to one you still intend to use. Boasting a large sensor inside a svelte shell, the PowerShot G9 X Mark II exceeds expectations. Its key features include a larger-than-average 1in 20.1MP sensor and an aluminium construction that Canon claims is 25 percent slimmer than the previous iteration, plus continuous shooting speeds of up to 8.2fps (thanks, in part, to a DIGIC 7 processor). If you're looking for a neat, easy-to-use compact camera that produces dramatically superior images to your smartphone, the PowerShot G9 X Mark II is a top choice. The Canon PowerShot SX720 HS is a superzoom travel compact that manages to squeeze a 40x optical zoom into its tiny shell. It has full manual control and built-in Wi-Fi, and delivers sharp, vibrant images. While its sensor is a little small, it boasts a back-illuminated design that helps it to capture light more effectively. We’d have liked to see a touch-sensitive screen, maybe one that can tilt up and down too, but it's perhaps due to the absence of these that Canon is able to keep the price down.